When both the emitting and receiving quark are known by their color as well as their spin, there is only 1 possibility for the colors of the gluon and that is the upper color as the color of the emitting quark and the lower color as the color of the receiving quark. The spin of the gluon is determined by the spin of the emitting quark. If the gluon’s spin fits in with the spin of the receiving quark it will be absorbed, otherwise it will pass by. And there we meet a problem. If the gluon’s lower color represents its destination and the spin doesn’t fit, the gluon has to pass by its destination. It wasn’t its destination after all which contradicts the gluon’s ability to know its destination. In this interpretation we are forced to admit the gluon not only to know the destination’s color but about the destination’s spin too. The gluon’s lower color is an accepted feature but there is no such thing as lower spin, knowledge about the destination’s spin. If the gluon sets off in the wrong direction it would miss its destination. So it have to know too the starting-direction of the path that leads to an encounter with its destination (no matter how that path runs). And maybe there are more properties that have to fit. When the gluon knows the color of its destination it knows about the spin of the destination too. And the precise direction of emission in space needed for an encounter to take place. When the spin doesn’t fit or the direction isn’t right or whatever-may-be-demanded-further is not satisfied, the gluon is not emitted. Then we do get rid of the whole sphere of superposed emitted gluons in all directions. We get rid of the gluon-superposition that passes by a color. Indeed no inverse square force law arises, but we have to invoke a new rule. The process of looking-in-the-future has to be investigated. Maybe the story in the next link is inspiring, www.lifesci.sussex.ac.uk/home/John_Gribbin/quantum.htm and then “Solving the mysteries” or “Solving the quantum mysteries”. When both emitting and receiving quark are unknown by neither their color nor their spin, we have the familiar 6 possibilities for the emitting quark in superposition at the start and the same 6 possibilities for the starting state of the receiving quark. The emitting and the receiving quark are unknown to us, the outside observer, but they do know each other. Three of the 6 emitting-quark start states have spin +1/2. They can only emit a spin +1 gluon. Each quark-color , and splits in 3 equal quark-colors, each of which emits 1 gluon with 1 of the 3 possible lower colors. A superposition of the 9 different spin +1 gluons sets off. At the destination 3 spin -1/2 quarks are waiting for them. Each of them splits in 3 equal worlds that each absorbs an appropriate gluon. So emission will set off and absorption will be completed. The remaining 3 emitting-quark start states have spin -1/2 that each split in 3 equal worlds that emit the 3 different lower-color spin -1 gluons. The superposition of 9 different spin -1 gluons sets off. The 3 remaining spin +1/2 quarks at the destination are waiting for them, split in 3 each and absorb them at arrival. The emission and absorption scheme is identical to that in the previous page number 11 (the Star trek interpretation). So in the Looking-into-the-future interpretation the virtual gluon exists as a superposition of 18 gluons connecting 2 unknown quarks along all possible paths and with no gluons passing by. This precisely looks like QED. Do photons look into the future? In QED there is the wavefunction for the displacement of a photon from spacetimepoint A to spacetimepoint B. In that wavefunction there is a factor 1/I, where I is the square of the spacetime interval between A and B. The amplitude of the photon’s wavefunction is reciprocal to the covered distance in spacetime. When squared to obtain the probability-distribution of the photon over spacetime, an inverse square dependence appears. This copes for the wavefunctions that lay along all those missing paths that start at A but do not end at B. The words “missing paths” say enough: a photon that can look into the future doesn’t miss paths. So no, photons cannot look into the future. Or would they? Would QED give the same results when the reciprocal dependence of distance is left out? Integration over all of spacetime with the amplitude as a cosmic constant? In this interpretation each gluon knows on forehand precisely what path does work out and they only go that paths. Then there is no distance-dependence in the wavefunctions of the gluons and no distance-reduction, if gluons can look into the future. The ensuing color force, mediated by virtual gluons, would be of the same strength all over spacetime, although it would be directed towards or away from its source. For QCD this means that any virtual color-reaction would impinge a contribution of the same amplitude to every point in spacetime. The coupling constant of the color force is nearly 1. Therefore the paths of the color-reactions may be as complicated as you like, this doesn’t reduce its contribution. Reactions like these count with the same importance. The first diagram is as usual. The second is a gluon covering some arbitrary distance in spacetime, meeting a yellow glueball there (meeting means absorption, emission or scattering) and then returning to its point of destination. The third is a gluon covering some arbitrary distance in spacetime, splitting there in 2 gluons that merge again and then returning to its point of destination. But as argued this is a rather rare process. 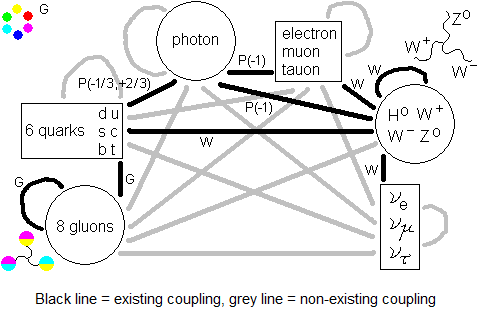 More likely is the fourth diagram, a gluon splitting in 3 gluons, although this process then costs more energy. The diagrams may suffer more energy-reduction when the number of involved particles increases. Does energy-reduction put limits on the possible reactions? Can one apply enough absorptions in between to keep the used energy within limits at all times? Energy-reduction then diminishes the number of contributing reactions but doesn’t really limit a row of subsequent reactions in time. A reaction can go on and on while all the time covering distance with the speed of light. As long as the antibaryon remains unobserved, the antibaryon can remain in a coloured state for ever if the gluon-distortion keeps evolving. There is one world where this actual is happening, so it must be part of the scene. This all looks better than the inverse square law but it doesn’t fit the proportionality with distance. At zero distance it doesn’t set the strength to zero. The strength would be the same there as everywhere. When the only reaction that can be afforded is the absorption of the gluon, we might be back where we started: a baryon or antibaryon can simultaneously emit 3 gluons and then restore white again in 186 ways. Distance effects then occur only at the decrease of the number of worlds in superposition when gluon-interactions come to completion. That is an effect in time, but since gluons move at c it translates to a distance effect. But there is no limit on when the sole gluon (or 3 of them) should be reabsorbed. At some higher energies it sets no limits on distance. This disagrees with the known range of the color force of 10^-15 meters. So no, the looking-into-the-future interpretation doesn’t really lead us anywhere, as far as I can see.